If I had a nickel for every time I’ve heard somebody say that to me over the last seven months since I started working for TeamSnap, I’d have approximately 982 nickels. Not exactly enough to retire on, but certainly enough to fuel a pretty serious coffee habit for a couple of weeks. But it’s true: I’m an extrovert. I like people. I like being around people. I like talking to people. Being around people makes me feel energetic and happy. Not being around people for too long is a major bummer that leaves me feeling sad and mopey. And if you just happen to be the poor first soul I encounter after a day of complete solitude and silence, brace yourself, because you’re about to be bombarded by a blast of ALL OF THE WORDS I HAVE BEEN WAITING TO SAY ALL DAY LONG. My apologies in advance. So, is it possible that a people-loving, super-social extrovert such as myself can survive the remote, independent work environment that is TeamSnap? Believe it or not, we have quite the community built up across our remote workplace. When I first started working for TeamSnap, I expected that I would largely have to satisfy my own needs for “extrovert time” by either working from a public space (coffee shop) or making sure that I had enough extracurricular activities (lunches with friends, improv classes, breakdancing lessons*) planned throughout the week. 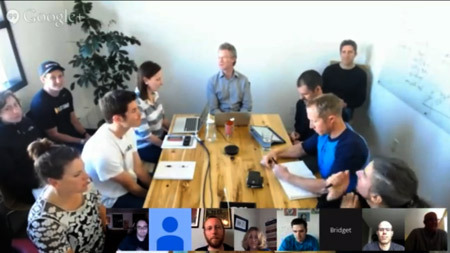 A typical TeamSnap company meeting includes live and remote participants. Dancing not pictured. And the beautiful thing about working for TeamSnap is that those things are all totally doable thanks to the flexible hours and freedom that come with working remotely. But what surprised me was just how much interaction I actually DO get throughout the day. Between regular video meetings via Google Hangout and using chat tools like Slack, I am almost never not in communication with at least someone. I chat constantly with folks I work with (and sometimes it’s even work-related), and that goes a long way toward filling the need to connect and interact with people. I still have some days where OH MY GOODNESS I HAVE TO GET OUT OF MY HOUSE AND BE AROUND OTHER HUMAN PEOPLE BEFORE I GO COMPLETELY NUTS, but those don’t happen nearly as much as I thought they would. And when they do happen, hey, I can take a break and meet a friend for lunch or go out for a jog. Or, I can drive 1.4 miles over to the nearest coffee shop, hop online and be back to work within just a few minutes. It’s awesome! Now don’t get me wrong; being a Work At Home Extrovert is not without its quirks. At times you may find yourself talking out loud to no one in particular, laughing way too loudly at your own jokes, or possibly even belting out a poorly-executed rendition of Trisha Yearwood’s 1997 hit “How Do I Live” at the top of your lungs. ** And sometimes you may find yourself accidentally doing those things after you’ve relocated to a coffee shop. But even on the worst of days when you have to throw your arms up in the air and run down the hall screaming just because it got too quiet in the house***, you know in the back of your head that you work for a pretty awesome company with a pretty awesome bunch of people who are just a few keystrokes away on your keyboard, and that can get you through just about anything. So what’s an extrovert like me doing in a work-at-home job like TeamSnap? Loving every minute of it, that’s what! Now, if you’ll excuse me, I need to go dig up my old Trisha Yearwood CD out of my closet. I have some brushing up to do. *Full disclosure: I have not taken any breakdancing lessons. Yet. ** I’d really like to say this is a hypothetical scenario. It is not. ***Again, I wish this were hypothetical. I also wish my roommate hadn’t been home that day. Bethany Garner is a QA tester for TeamSnap, tasked with ensuring the appropriate amount of awesomeness (all of it) exists in TeamSnap and its features before we release them out into the wild. Bethany lives in Portland, OR, for the past 21 years and enjoys “slightly quicker walking” (her own version of running) and performing improv comedy as part of ComedySportz Portland.